Swanson seems likely to be 1-1 pick. Photo by Joe Howell. The MLB rule-4 (Amateur) draft starts on Monday 6/8/15 at 7pm. See MLB Network for the best coverage. Since we’re also going to be talking about prep regional results and CWS results early next week, I thought i’d get this draft coverage post out there. This post has good links to use to see draft prospect rankings, then links to help cover the draft starting monday, then some blurbs on local players of interest, and then links to a bunch of mock drafts. here was our 2015 pre-season local player link. the shake-up at the top of draft boards with the news of Aiken and locally-tied Matuella‘s TJ surgeries in March. Here’s a slew of Draft Prospect rankings : these are NOT the same as mock drafts; see further down for those. Jon Sickels early draft thoughts. Kiley McDaniels early draft rankings. 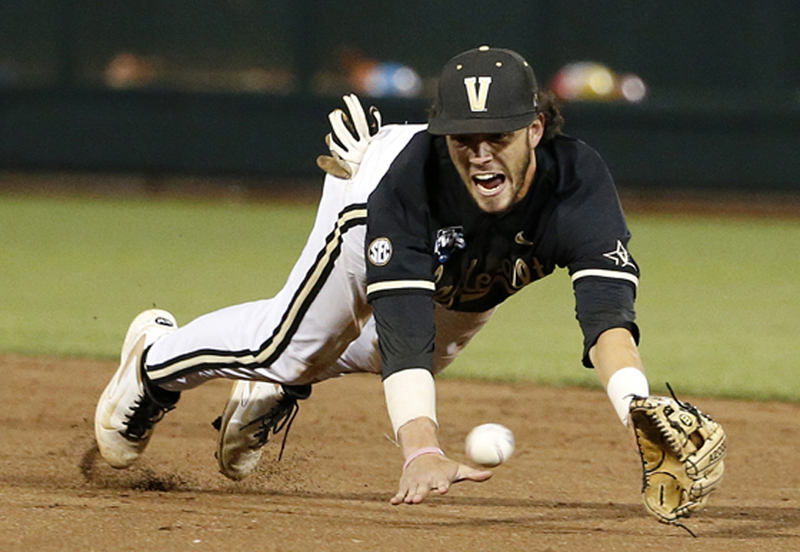 MLB’s Late may top 200 draft prospect rankings. MLB.com Official 2015 Draft Central home page. MLB’s Awesome Draft Tracker; you can slice and dice the draft 10 different ways, search by schools and home states, etc. Official MLB 2015 Draft Order (Nats first pick is #58 well into the 2nd round, next #69, then #103, then #134 in the 4th round, and then 134+30 picks there-after. Official Draft Bonus Pool totals. Astros have $17M (most). Nats have 3rd least at $4.1M. Nathan Kirby Lat strain Press Release: UVA’s ace Kirby, considered a mid-to-late 1st rounder, missed a huge chunk of the season with a Lat Strain. If the cards fall right, he may be able to pitch UVA’s 3rd regional game. MLB has him ranked #26, as does BA. Mike Matuella, of Great Falls (Georgetown Prep) and Duke, remains a back-end of the 1st round draft prospect but is also rehabbing his own TJ surgery. He has far less of a track record than other college arms, and may be a crap shoot in the draft. MLB has him ranked #28, BA #23. Taylor Clarke, who hails from Ashburn (Broad Run HS), was named the CAA pitcher of the year while putting up stellar numbers for the College of Charleston, a trendy underdog pick to reach the CWS. MLB has him ranked #144, so that’s perhaps a 4th-5th rounder, while BA has him higher at #118. Here’s a draft profile of him from scout.com. Joe McCarthy, OF for UVA, missed most of the season with a back injury and then hit horribly after wards. His draft stock has dropped from a supp-1st to probably the back end of the 2nd round. MLB has him ranked #68, BA #46. Josh Sborz got dumped out of UVA’s rotation but still is ranked #115 in MLB’s pre-draft rankings (projecting to a 3rd-4th rounder). Brandon Waddell had a good season as UVA’s #2 starter … and MLB projects him as a 5th rounder at #163. BA has him at #153. University of Maryland’s two best draft prospects are Alex Robinson (MLB ranked #124) and Brandon Lowe (MLB ranked #148). Robinson is #74 on BA’s top 500 list and Lowe is #98 on BA’s list. Radford’s Michael Boyle has pushed his draft stock up with his team’s post-season performance; BA has him ranked #132, which puts him in the 4th-5th round. Cody Morris, probably the best local player matriculating this year, had to undergo TJ surgery and likely scuttling his draft plans. Luckily he had already taken a scholarship offer to South Carolina, where he will now presumably attend and rehab to get ready for the 2016 season. BA still has him ranked #265 but the odds of a team taking him in the 8th round seem slim. A.J. Lee of St. Johns earned his 2nd straight Gatorade DC player of the year award and remains committed to Maryland; I do not sense he is a significant draft prospect and will go to College. He is not in BA’s top 500 prospects. Ljay Newsome of Chopticon (south of Waldorf) made some noise with his stellar 3-A state final game; he has not picked a college and I wonder if he’s headed for the draft. He is not in BA’s top 500 prospects. Nic Enright of Steward HS in Richmond (2015 Gatorade player of the year) is signed to Va Tech but ranked #132 by MLB. Will he sign if he gets 3rd round money? BA’s got him ranked far lower; #230, in the range of draft rankings where it makes more sense for him to go to school. Andrew Suarez, the Nats’ 2nd round pick of last year, had a decent if not spectacular senior season at Miami and may end up getting picked right in the same spot. MLB has him #75, BA #73. Austin Byler, the Nats’ 9th round pick of last year, is ranked #199 by MLB (but much higher at #115 by BA) putting him in the 7th round or so. Not too much of an improvement over last year; his senior season was more of the same for him; lots of power, perhaps stuck at 1B so will really have to hit his way moving forward. Skye Bolt, the Nats’ 26th round pick in 2012, had a great UNC career and is ranked #67 by MLB ahead of the draft. BA has him a bit lower at #106. Maybe the Nats can draft him again since this is right around where their first 2015 draft pick falls. Chris Crawford Mock #1: Garrett Whitley, Swanson, Rodgers, … the rest behind a pay-wall. D1baseball.com Mock #1: Swanson … and the rest behind a pay-wall. PerfectGame.org’s mock drafts and coverage now behind a pay-wall. Swanson: I think Swanson’s post-season hitting combined with his positional flexibility and the decline of all the upper-end college arms that have been mentioned in the conversation for 1-1 (First Aiken & Matuella, then Tate, then Funkhouser and Fulmer) has cemented Swanson’s spot at 1-1. In other years, he’d be lucky to go in the top 10. Not this year. Arizona goes with the least risk; proven college hitter. Bregman: practically every connected pundit now has Bregman going 2nd. Houston gets a sure thing and goes prep with #5. Rodgers: Houston hasn’t backed away from HS players before and get the best one, a SS with power, at #2. Tate: Tate’s regional performance pushed him back into this lofty level and he’s a better bet than Jay thanks to his reliever status all year. Colorado likes college arms this high. He makes the most sense. If this pick isn’t Tate, its Jay. Tucker: practically everyone has Houston’s 2nd pick on Tucker, meaning they’re taking two upper-end prep talents. Plus the Astros know the family; Kyle’s older brother Preston was a 7th round pick by Houston in 2012 and made his debut this year. Makes too much sense. So, just so you know, this guess matches the final mocks of Law, McDaniel and Ellis, and is nearly identical to the final mocks of a couple others. This top 5 means some big time names are available 6-10. Cameron, Jay, Fulmer, Clark and Harris could very well be in the next 4-5 guys picked. Funkhouser seems to be slipping. Also throw the likes of Andrew Benintendi, Tyler Stephenson, and Walker Buehler into the top 10 possible mix. Now that we’re into the 2015 season, we are officially through the “prospect ranking” season. I have updated two important prospect tracking spreadsheets that I maintain with a host of links and updated information. First; the Organizational Rankings Spreadsheet. I’ve got 59 different rankings now collected of the 30 teams’ organizational rankings over the years. The big “holes” I have in this spreadsheet are the Baseball America handbooks sent out each January … though it seems to be safe to say that the official released Baseball America rankings in March or April of each year effectively mimics the rankings in the publication. The rankings go back to 2001, with a link to even earlier Baseball America rankings. Only BA goes back that far; other experts go back to 2007 (Baseball Prospectus), 2009 (Keith Law/ESPN) and 2012 (MinorLeagueBall.com). Secondly, a republishing of the Nats Prospect Ranks going back in time. I’ve greatly updated this spreadsheet from the earlier publishing of it this off-season, now having 79 separate rankings of Nats prospects going back all the way to January 2005. 178 different Nationals Prospects appear on the list, spanning from current #1 Lucas Giolito to the first #1 listed (believe it or not, Mike Hinckley in BA’s January 2005 list). There’s a separate tab in the XLS tracking the major pundits: Baseball America (J.J. Cooper, Aaron Fitt, John Manuel now, formerly Jim Callis), Baseball Prospectus (Chris Mellon, Jason Parks now and Kevin Goldstein for years), MLB (Jim Callis and Jonathan Mayo), MinorLeagueBall.com (primarily Jon Sickels), Fangraphs (Marc Hulet, Kiley McDaniel), ESPN (Keith Law) and Prospect Digest (Joseph Werner). As always, if you can think of pundits who i’m missing, i’m always up for more information. Or if i’m missing links, let me know. Both these links are also available directly from the “Links” section on the right hand side of this blog in the “Nats Arm Race Creations” section.